Customer Service is not only about one technology; it is about the set of technologies you will need to bring your business into the modern age. It is about starting with a clear and concise vision of the service experience you intend to deliver to your customers. In order to accomplish this, you do need to understand your customer needs and how your customers seek value. It is clearly, the ‘Jobs to be done approach’. These types of activities are very different from mapping internal business processes to look for efficiency. 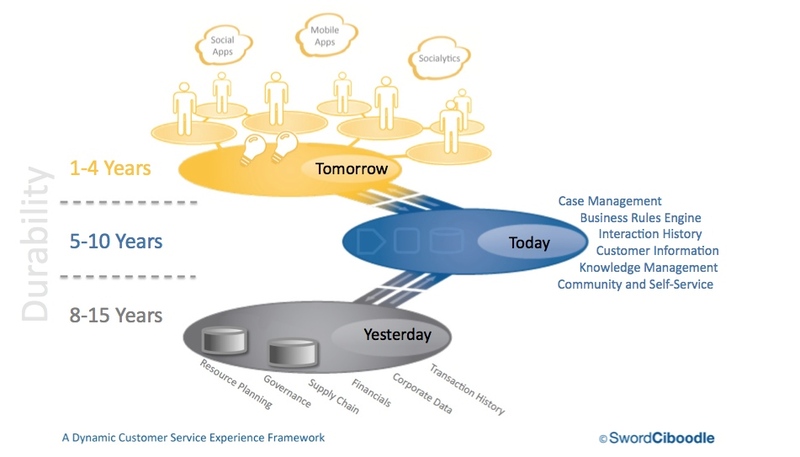 Evaluating your technology stack, with your customer service experience lens, is an important exercise. Everything you do should begin with a strong foundation. We all learned these lessons from very early on; from education, to athletics and yes, even business. Whether it is Facebook or Twitter; Linkedin, Quora or FourSquare the activity that is important to you is, or will be, happening on a platform, through a channel, right in front of you, where you can’t get to it. The social media platforms, as they have become to be known, are where customers are, so your organization has to go there. But, which ones? Will this answer change in a week, a month, a year? The fact is that these external forces are part of your business, which you will fight to control (technologically and process wise) and will fail, thus figure out how to leverage and embrace them, not fight them. These platforms represent your ability, your advantage to innovate and transform your business. Your ability to control which channels and technologies your customers use is long past. Is it possible that your best and most powerful long-term strategy is the ability to make tactical decisions faster than your customers expect (exceed expectations)? Does responsiveness outweigh the business value of implementation via a coordinated, planned and sustainable architecture — or not? In any case, the framework suggested allows for varying rates of change across layers; what was yesterday’s innovation, might just become tomorrow’s differentiators (not to confuse too much). Coming full circle; The ability to provide customer service excellence is achieved by a harmonious dance between the people, processes and technologies supporting every modern business. These are the core building blocks making up the foundation of all world-class customer service organizations. Does this sound like your kind of customer service? – It should and it can! Remember, customer service experience is the customer’s perspective, in response to your efforts. Be sure that the customer’s perspective is all that you want it to be. This is Part two of a two part series. The first in the series; Creating Graceful and Rewarding Customer Service Experiences can be found on the Sword Ciboodle sponsored Under The C, blog.